Abstract: The Margherita Palace is a heritage masonry structure constructed two centuries ago in L’Aquila (Italy) and extensively damaged by the strong 2009 earthquake. The palace was considered unstable and therefore temporarily supported to avoid its collapse. 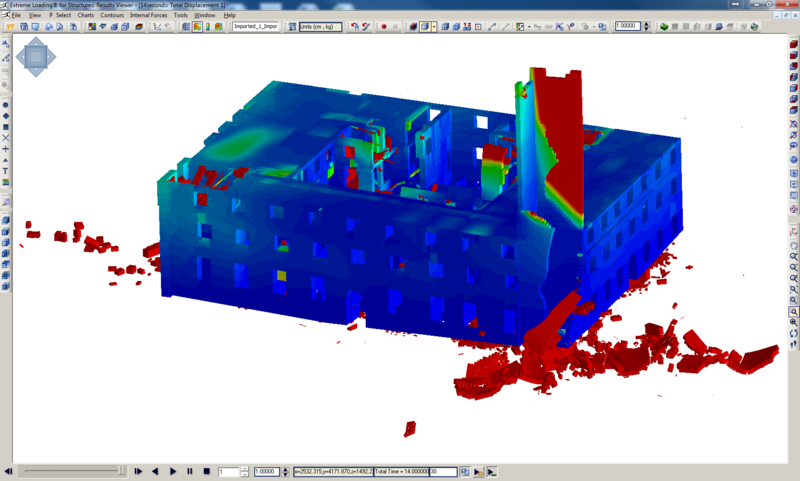 A structural survey of the palace walls and floors was carried out using laser scanning. 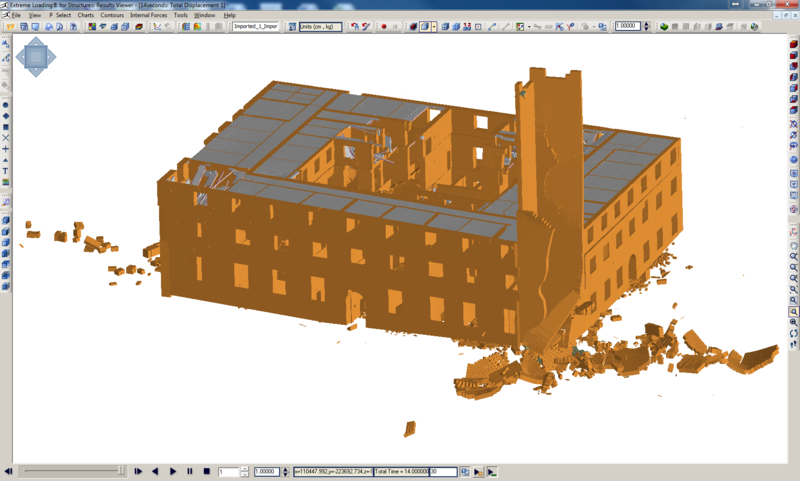 The laser scanning data was post-processed to create three dimensional model including the cracks and damage in the different structural elements. The paper discusses challenges dealing with both the laser scan data set and detected damage data to create a full 3-D Applied Element Model of the existing conditions of the building with cracking and material damage. The challenges include the removal of noise from the data, meshing challenges to create 3-D elements with acceptable aspect ratio and applying existing cracking and weakening to different components. Nonlinear dynamic analysis is performed for the damaged structure to check its partial or total collapse resistance if similar strong earthquake were to be applied to the structure, without the temporary supports, again. 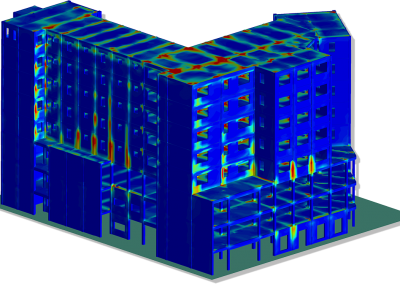 This analysis helps determining the weakest point of the structure which needs special retrofit attention. 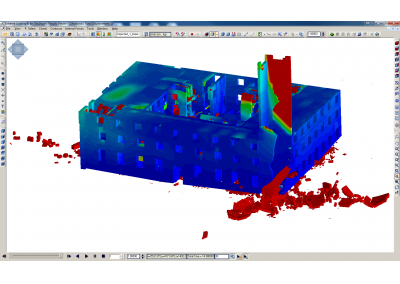 Key Words: Heritage Masonry Structure; Laser Sanning Survey; 3-D Applied Element Model; Nonlinear Dynamic Analysis. Abstract: The paper describes the complexity of the seismic assessment and rehabilitation of three different existing buildings in New Zealand. The assessment was performed using Progressive Collapse Analysis. This method has been materialized into explicit requirements for redundancy in building codes. Conventionally, the engineering industry uses a simplistic procedure for most seismic assessments, which models only linear beam and column elements. This neglects the contribution of walls and slabs, leading to uneconomic solutions. Walls and slabs may be considered secondary members in other types of analysis but in progressive collapse analysis, walls and slabs often behave as primary members with slabs carrying load though membrane action and walls providing alternate load paths in case of loss or extensive damage of columns. 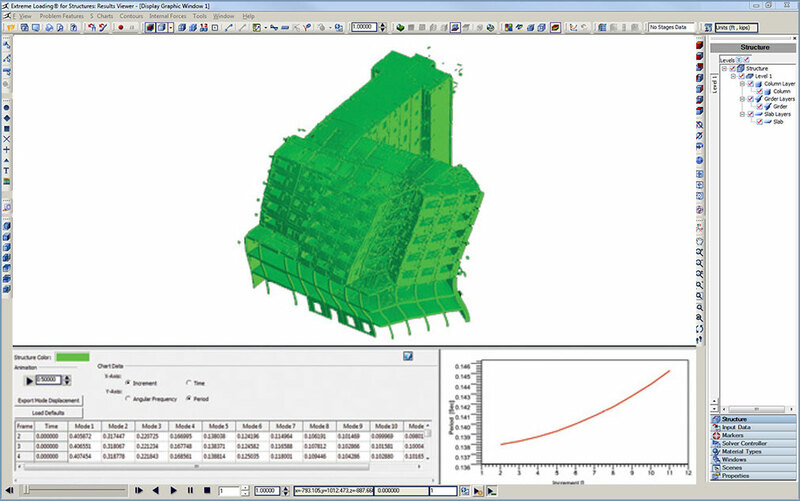 The buildings have been modelled using the “Applied Element Method” (AEM) [1, 2, 3]. 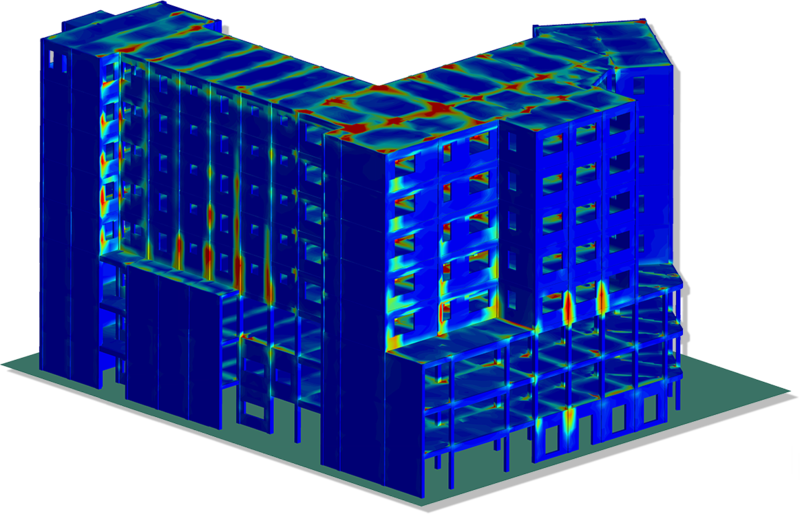 This approach allows tracking of the structural collapse behavior passing through all stages of the application of loads including elastic stage, crack initiation and propagation in tension-weak materials, steel yielding, element separation and element collision. It has also the unique ability to accurately evaluate the dynamic Eigen modes accounting for the phenomenon of period elongation due to cracking of the structural elements during the ground excitation. Period elongation is a phenomenon that may alter significantly the response of the structures and the effects of the ground motions on the buildings. This is a significant breakthrough not only for the New Zealand industry but also for the international engineering community. Extensive research was undertaken to overcome the modelling complexities to incorporate the specific building characteristics including riveted connections, slabs, infill panels, foundation and surrounding soil and to assess the performance of the structures using the state of the art methodology [4, 5, 6, 7]. A set of Numerical Integration Time History (NITH) analyses in compliance with AS/NZS 1170.5  recommendations was completed for the Progressive Collapse methodology. Various geotechnical and material testing was undertaken to confirm the parameters used in the analysis. The ground motions were selected and scaled in accordance with Site Specific Seismic Hazard Assessments. To validate the accuracy of the models, the results were checked against ASCE41-13  acceptance criteria in conjunction with AS/NZS code requirements and limitations [7, 9]. The post-earthquake observation in one of the case studies were used to validate the results of our analysis. The results indicate the efficiency of the specific methodology to visualize the extent, magnitude and direction of any potential local or global collapse or crack occurrences within the structures and provide accurate insights on the performance of the buildings, leading to the most effective strengthening strategy. This methodology also enables the engineers to safely design the egress routes away from falling debris, for the safe evacuation of the buildings during the earthquakes. Abstract: During the 2009 L’Aquila earthquake, the tower of Santo Stefano di Sessanio, the town’s iconic symbol, collapsed to the ground. The tower was believed to have been rendered vulnerable to collapse because of 20th-century renovations to the tower’s observation platform, which replaced a wooden deck with one made of reinforced concrete, thus making the tower top-heavy. 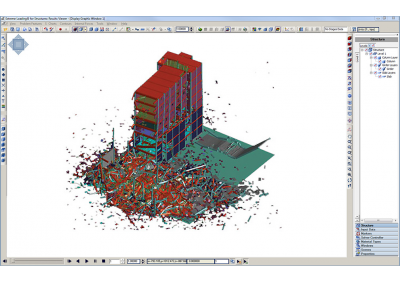 In the current study, a numerical analysis was used for investigating the collapse behavior of the tower. Doing an initial elastic model of the tower did not allow any realistic prediction of the anomalous seismic behavior showed by the tower; the reason why only a stump of structure actually survived the earthquake remained unexplained. 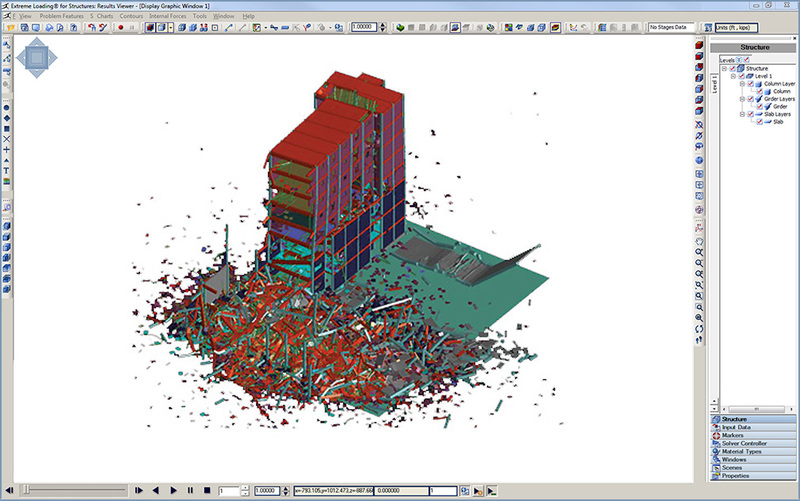 The collapse of the Medici tower is then investigated using a full 3D Applied Element Method (“AEM”). AEM is a discrete crack approach method in which the structure behavior till its collapse is followed. Two models for the structure of the tower were considered in this study. In the first model, the walls were modeled as regular brick elements neglecting the random real shape of the stones of the tower, while in the second model the real random shape of the stones was considered. Fully nonlinear dynamic analysis is carried out including the hysteretic constitutive models of the stones and connecting mortar. Damage obtained from regular elements analysis was somehow overestimated compared to the real damage. On the other hand, the real mesh analysis showed better results closer to reality. 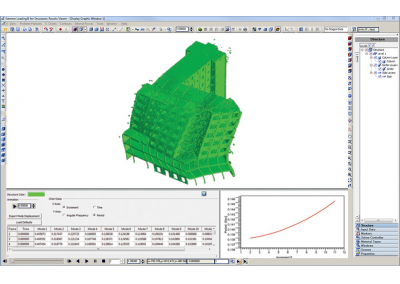 Key Words: Heritage Masonry Structure; 3-D Applied Element Model; Nonlinear Dynamic Analysis.